We Specialise in adaptations and alterations for people with disabilities. Making homes more ‘user friendly’. Keran Mellor Services Limited is a family property maintenance and repair company, which has been trading for over 10 years. They specialise in carrying out work to make life easier for people who are less able. Bathrooms are a very important part of this, adapting them to suit individual circumstances and requirements. All aspects are taken care of; plumbing, tiling, electrical work, special needs equipment and of course decorating to finish. However, it does not stop there. They will widen doorways to accommodate wheelchairs, remove thresholds, supply and install new front and rear Upvc, zero threshold doors, build ramps to specification, supply and fit handrails, stair rails and grab rails, raise or lower electric sockets, supply and install special needs kitchens, with a full range of user options. In short, all the work required to make a home more accommodating for anyone with a disability. So if your home needs any alterations to make your life more comfortable just contact Keran Mellor Services. 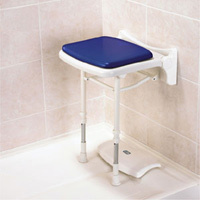 We have over 10 years experience altering and adapting bathrooms to accommodate the needs of people with disabilities. installing low access ,level access shower trays or Wet floor facilities, raising toilets, supplying and installing al acc shower units, taps with lever controls, carer doors or cubicles, safety flooring and support rails Wall tiling as required. We take care of it all. Including electrical works and safety flooring. Currently we carry out grant works for several local authorities & Care & Repair Agencies and will be delighted to provide references. Another area of our expertise is adapting kitchens for special needs users, fitting an attractive kitchen which will enhance any home but which provides the user with the necessary punctual, efficient workspace. 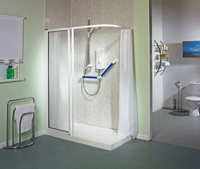 We can also often adapt existing fittings to suit individual requirements. Often a few steps, a narrow doorway or a raised threshold can be a major obstacle widening doorways, fitting doors with zero thresholds for wheelchair users, providing level platforms or easy to navigate ramps it’s all in a days work for KMS.